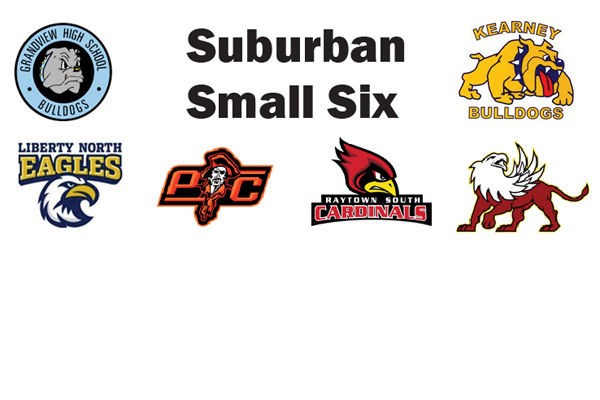 If you are looking for a meat grinder of a conference look no further than the Suburban Small Seven. This mix of Class 4 and 5 teams on the Missouri side has teams with rich history and recent success and stretches from Platte City to Grandview. The conference title was won by Platte County last season in the final game but the Pirates won’t have an easy time this year. Let’s take a look at each team in the conference. The Bulldogs have a strong senior class but are looking to replace their entire offensive line and quarterback. There is also a change in philosophy for Grandview. Head Coach Andy Leech said he is focusing on the defensive side of the ball after being an offense first team the last few years. Grandview has finished at the bottom of the league the last few seasons but it has talent, experience and could be a team on the rise in 2013. The Bulldogs were a dominant program in Class 4 for more than a decade but are now spending their second year in Class 5. Kearney lost some good players but return nine starters on offense and six on defense including standout tailback Brock Broughton. Under coach Greg Jones Kearney has become one of the toughest places to play in the Metro and this year the Bulldogs get Platte County, Grandview and Winnetonka at home in conference along with Park Hill and North Kansas City out of conference. Jones likes the experience of this year’s team and knows that they need to find effort week in, week out. Kearney should be fighting for the conference crown all season long and be a player in Class 5 when the postseason rolls around. In three short seasons the Eagles have gone from not existing to a successful football program. This senior class of 28 is the first to go all four years at Liberty North. Coach Ken Clemens and his staff have seven starters back on both sides of the ball and look to take a lot of experience into the season. There is no easy stretch for North either in the conference or in the Class 4 postseason. The Eagles lose a talented running back Antwynn Beavers but there is depth at that position with every player who touched the football in 2012 is back besides Beavers. “The community is awesome and it just produces great kids,” Clemens said. “The best part has been the consistency of coming in and working hard. They surprise me daily with their work ethic and dedication. The Eagles looked like a breakout team in 2012 but this could be the year they make a big move in the conference and in the Class 4 postseason. The Pirates enter as the defending conference champs coming off a run to the Class 4 quarterfinals where they lost to Harrisonville. Gone are quarterback James Valentine and receiver Scottie Wilson but a talented, experienced group remains. The experience for Platte County comes on the offensive line, defensive line and the linebackers. The Pirates have some good skill players and have shown the ability to replace quarterbacks and not miss a beat offensively. “In four years we’ve had three different quarterbacks with three different styles yet all three are effective,” Platte County coach Bill Utz said. “A lot of it goes to the kids and to the structure. If the Pirates offense can continue its strong run the defense will keep it in every game. Platte County could be primed for another strong year. The Cardinals could be primed for their best season since a trip to the Class 5 state title game in 2008. Raytown South is now in Class 4 for the second year and with eight starters on offense and nine on defense back it could be a banner year. While they will need to replace key spots like quarterback, linebacker, running back and a defensive back and kick returner, the bulk of both sides of the line are back with size and experience. The Cardinals have a strong schedule outside the conference and should be battle tested by the time the postseason comes around. The Cardinals are a dangerous combination of size and speed that isn’t usually seen at the Class 4 level and it could lead to another trip to St. Louis. The secret is out about Winnetonka. The Griffins have been on a steady rise the last three seasons and this could be the year they take the big steps by winning the conference and playing deep in the postseason. There are eight starters back on offense and five on defense including some of the biggest playmakers in the Metro. Senior Aaron Mends leads the way on both sides of the ball. The Iowa commit is a dominant linebacker who will also see time at tailback. The other tailback is Marquise Doherty and he is capable of big plays and tough yards to lead the offense. This could be a big year for the Griffins with maybe a trip deep into the playoffs and who knows maybe all the way to St. Louis.